We are a fully authorised distributor of Prysmian Bicon Trefoil Cable Cleats for Trefoil Cables. Also we distribute a complete range of Ellis Patents Trefoil Cable Cleats for Trefoil Cables. The Ellis Patents Range also includes a range of Cable Cleats for Quad Cable Clamping or Multi Cable Cleat formations. In addition Ellis Patents are able to produce Cable Cleats to bespoke designs on request. Please contact us for more information or to discuss your specific requirements and our qualified team will be happy to help. 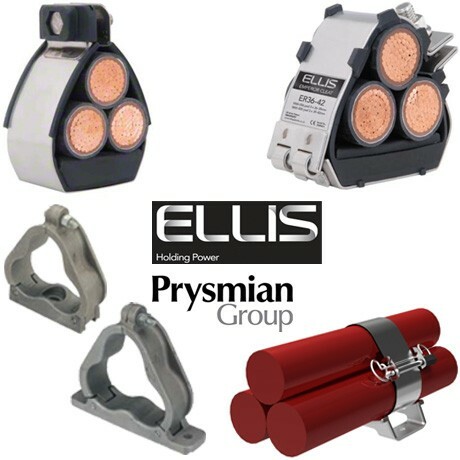 This comprehensive range of cable clamping solutions from Ellis Patents and the Prysmian Group (formerley Pirelli Cables, BICC, Bicon, Biccon) includes Stainless Steel Trefoil Cable Cleats, Aluminium Trefoil Cable Cleats, Cast Iron Trefoil Cable Cleats, and Galvanized Iron Trefoil Cleats.